We’re entering the not beekeeping end-of-season phase of the beekeeping year. There’s been a marked reduction in visitor numbers to ‘The Apiarist’ over the last few weeks and – with the weather gradually deteriorating1 – the ‘shack nasties‘ are starting to develop. The online forums (fora?) are filled with increasingly bad-tempered arguments discussions and it might be too soon to be thinking about 2019 (it isn’t). 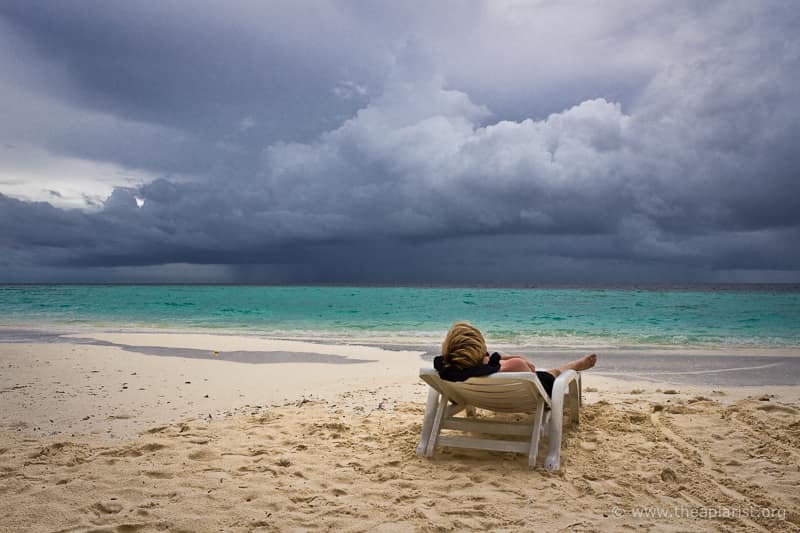 … I’m instead going to spend the next few weeks on a variety of odds and ends. Some interesting and amusing science, some ‘teasers’ on grow-your-own-denim-knit-your-own-yoghurt beekeeping, an introduction to why people keep bees and why they shouldn’t and a long and apologetic explanation of where the site disappeared to when I tried to move it to another server. Actually, of these only the first exists (see below). The last I hope not to use, though I will be switching servers to accommodate changes in security and to speed things up and to introduce site-wide intrusive advertising and a subscription model to fund my seemingly-unstoppable purchasing of essential beekeeping stuff from Brian at Thorne’s of Newburgh. The eyesight of bees is remarkable. Actually, eyesight alone is not enough. It’s the combination of eyesight with the neuronal processing of the received images that’s truly remarkable. Remember that the brain of a bee is about 1mm3 and contains about one million neurones 3. With this brain the bee is able to undertake a series of complex mental tasks involving learning and memory, image processing and visual generalisation. Bees soon learn that particular flowers yield lots of pollen or nectar. They can return to them time and again, recognising them at relatively short distances from their appearance. How do they determine that other flowers – of different shapes, sizes or colours – might also have valuable pollen or nectar? What about tree flowers that have a different appearance again? It turns out that bees are generalists, at least where flowers are concerned. They recognise things that are flower-like. They have evolved to associate reward (pollen, nectar) with things that have the appearance of flowers. Do they only have the ability to identify flower-like ‘things’. Are bees generalists when just identifying flowers and flower-like things, albeit of different colours, sizes and shapes? Is there some sort of hardwiring in the brain of the bee that has evolved this exquisite combination of flower-recognising sensitivity and flexibility? Alternatively, perhaps bees have a more adaptable image processing capability? For example, we know through simple experiments that bees can rapidly learn to associate very unflower-like shapes with a syrup ‘reward’. You can train bees to repeatedly return to a distinctively coloured/shaped item with a syrup reward. Over short distances you can move the item and the bees return to the new location, with the final approach being guided by vision, pattern recognition and associated image processing. The item doesn’t need to look much like a flower. They can also identify ‘diamond-shaped things’ (again, for example, other shapes are available at a bee lab near you) of a different colour, or even no colour, to those they’ve been trained on. This suggests that – at least for simple ‘not-flower’ shapes like these – a degree of generalisation is still possible. But bees operate in a very busy and variable environment filled with shapes and colours that form wildly variable complex images. Generalisation might well be a problem with all of this variation and complexity. Bees are good at discriminating between images of simple shapes. How good are they are at recognising the sorts of complex shapes and images that are found in the environment? What about something that our bees see every week? Something they might associate with disruption and/or reward? It turns out that bees can distinguish between faces. Very well. 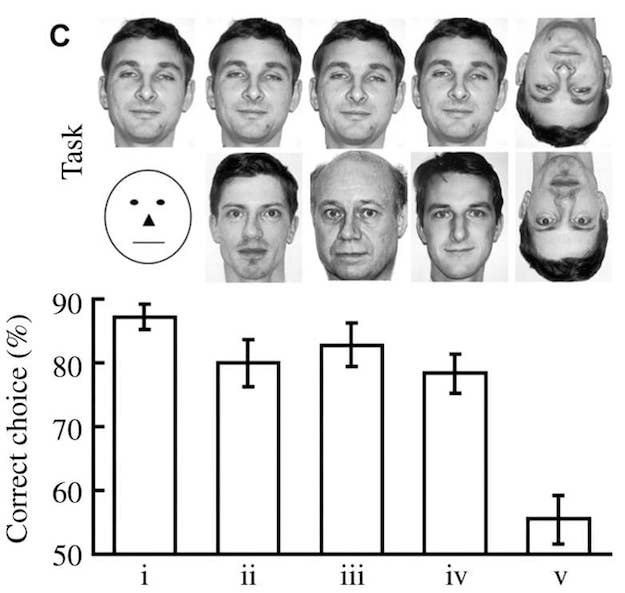 When trained to a syrup reward on one face (top left in image below), they can distinguish it from a different face (second row) about 80% of the time (graph). There’s a distinct possibility your bees recognise you. An interesting twist on the comment many non-beekeepers make about whether we can identify ‘our’ bees. However, bees trained to recognise a face the ‘right way up’ failed to identify the face if it was inverted (column v above). Don’t do your hive inspections standing on your head. Bees can certainly discriminate well between complex images like faces. Are they also able to generalise when it comes to complex image analysis? For example, could you train bees to associate reward with a range of female faces? Then challenge them with discriminating between a pair of new (never seen before) male and female faces? Would they pick the female face significantly more than 50% of the time? That’s a pretty tough test. Without the labels how well do you cope with this training set? OK, if that’s too hard, how about an analysis of image generalisation based upon the style of the image? Humans are pretty good at this sort of thing. We can easily discriminate between the Impressionist painters (e.g. 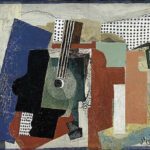 Degas, Monet, Manet, Renoir) and those in the early 20th Century Cubist art movement (e.g. 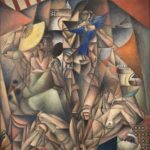 Picasso, Metzinger, Braque, Gleizes, Léger). 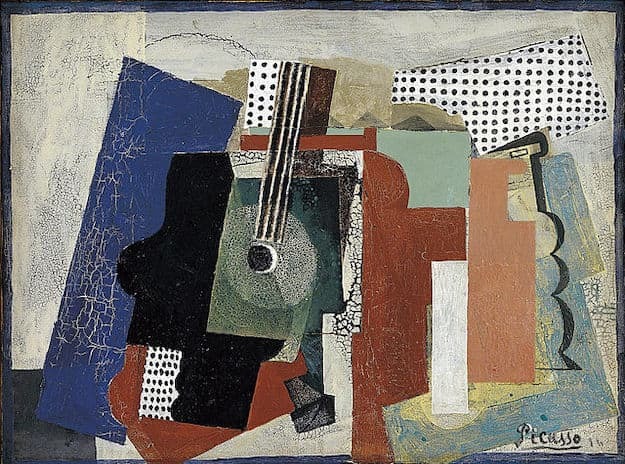 For example, is the Picasso (below) Cubist or Impressionist? We can tell … can the bees? Wu and colleagues4 recently attempted to answer this question. 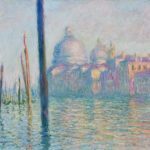 They took pairs of paintings matched for luminance, colour and spatial frequency information, one by Monet (Impressionist) and one by Picasso (Cubist). Bees were trained to associate either the Monet or the Picasso with a syrup reward. When subsequently tested, bees were able to easily identify the painting they had been trained on from one by the other artist. 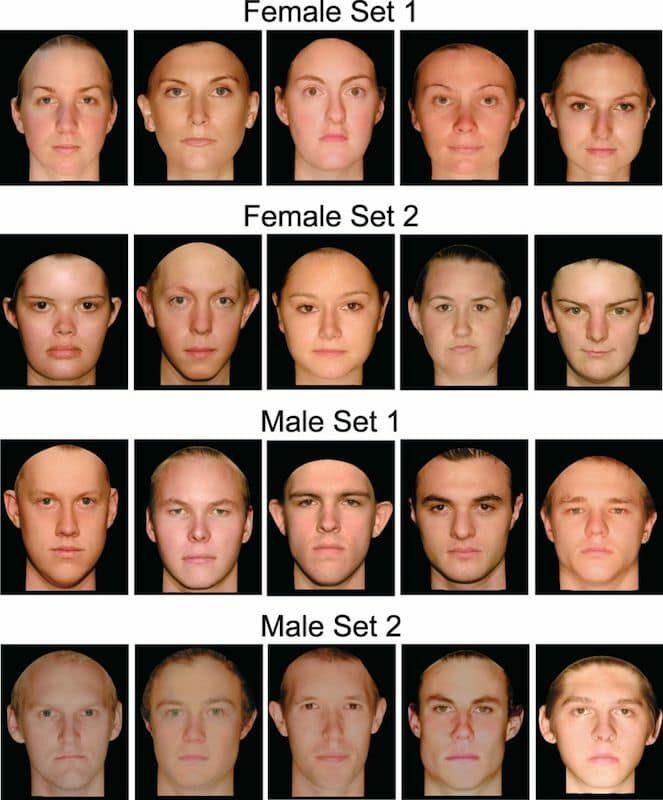 After 30 training blocks bees made the correct choice about 75% of the time … approximately the same accuracy with which they identify faces (above). This is not fundamentally a different experiment to the face recognition study as both involved the discrimination between just one complex image and another. Using five different pairs of luminance, colour and spatial frequency-matched paintings from Monet and Picasso – with five days of training – they demonstrated that bees could simultaneously discriminate between them up to 75% of the time. The more training the bees received, the better they were at picking the correct painting each time. Having trained the bees on multiple Picasso or Monet paintings they then challenged them with new (to the bees … you’ll appreciate that these artists no longer produce new work 😉 ) paintings by the same artists. Could bees that were able to discriminate between The Cliff at Étretat after the Storm (Monet) from Le Rêve (Picasso) and between Water Lilies and the Japanese bridge (Monet) from Girl before a Mirror (Picasso) and three other pairs correctly select a previously unseen Picasso or Monet? The statistics are poor. For one of the novel pairs tested it appeared as though the bees could discriminate as well as they could one of the training pairs. 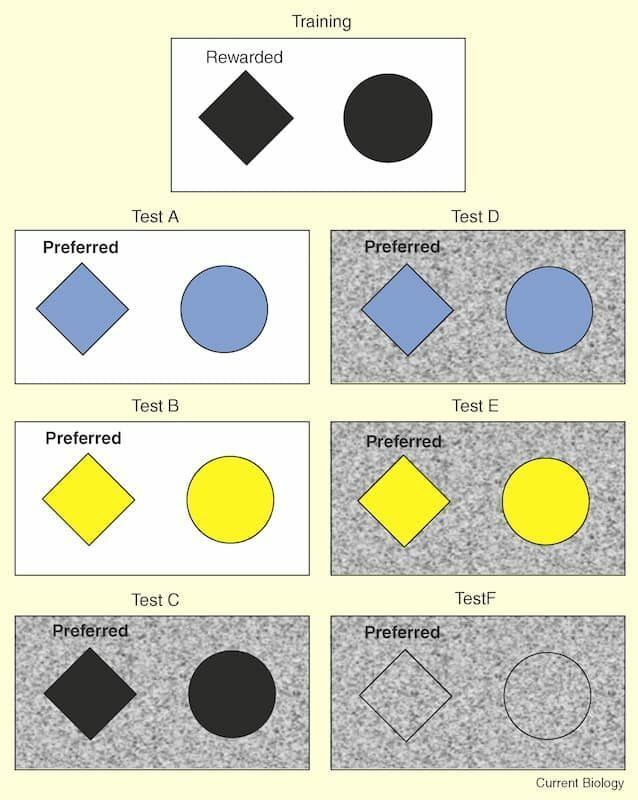 However, the most positive statement that could be made by the authors was “Notably, for both groups the percentage of correct choices for novel pairs was above chance (i.e., above 50 %) in six out of the eight tests, indicating that a weak generalization may have occurred”. Underwhelming … in this sort of science the stats wins every time, and this type of statement isn’t very compelling. Finally, the scientists repeated the entire training regime with greyscale versions of the same training pairs of images. With this training, generalization to the novel pairs was quite a bit better with “only marginal or no significant difference between training pairs and most novel pairs”. Better, but still not really statistically compelling. However, don’t underestimate the complexity of the task. The results showed that insects with a sesame-seed-sized brain could often discriminate between previously unseen Cubist or Impressionist paintings after a few days training on only 5 pairs of paintings of the same style. Pigeons live in the same visually complex environment as bees. They have to undertake similar visually demanding tasks during foraging. They can discriminate between Monets and Picassos. 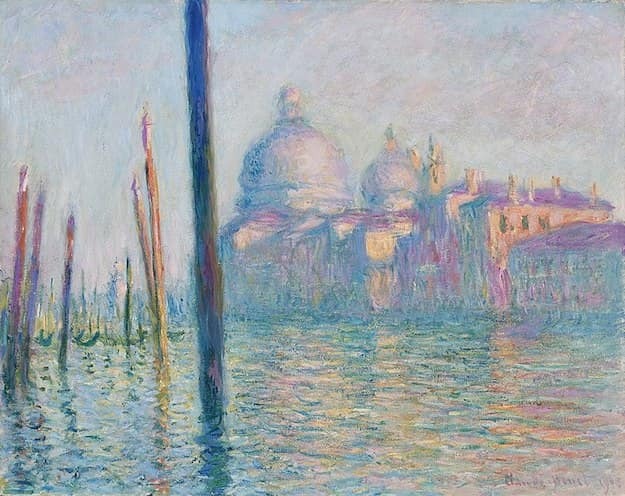 They can correctly (and statistically convincingly) determine whether a new Monet or Picasso is more Impressionist-like or Cubist-like. In addition, when challenged with other paintings of similar styles by different artists (e.g. 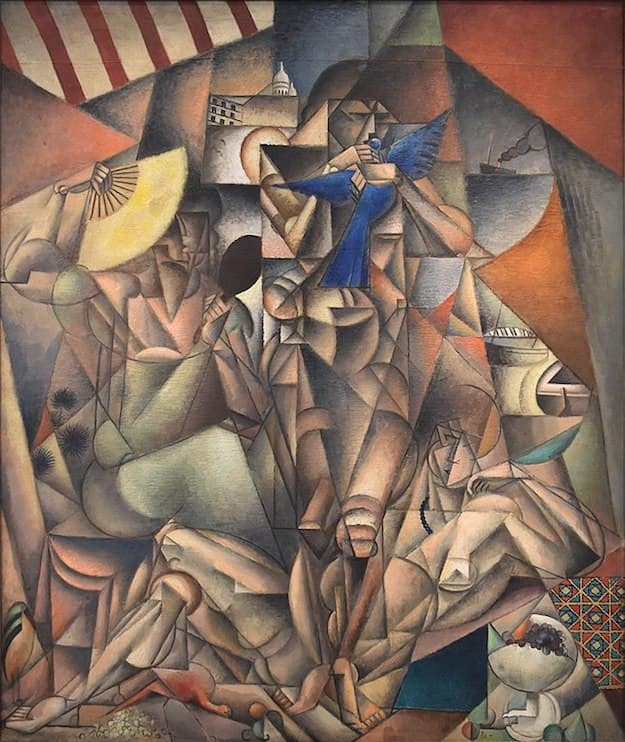 a Degas or a Braque), pigeons can again generalise in their selection of Cubist or Impressionist 5. However, to achieve this remarkable visual feat, pigeons need to be trained to hundreds of exemplar paintings over many, many weeks. Could bees do as well if trained for the same period? This post was written as the political fallout of the draft Brexit deal was occupying 110% of the news. By the time it appears online it’s not clear the UK will have a Prime Minister or even a functioning Government. Be that as it may, there will be a Parliamentary vote on it. Historically, there is a division of the assembly into those that support the motion (the ‘ayes’ i.e. ‘yes’) and those that do not (the ‘noes’). Once the vote is taken – typically by members of parliament traipsing into the appropriate division lobby – the Speaker counts the votes and announces The Ayes have it … assuming the motion was supported. Considering the timing, a pun on The Ayes have it seemed appropriate. With apologies to readers in the antipodes who are six months ahead … or behind, depending on your perspective. I have outlines – or at least titles – of all of these squirrelled away in my drafts folder. However, none of them are erudite, well argued, coherent, logical or persuasive. Now or probably ever. For comparison, the human brain – with a few notable exceptions, some in remarkably responsible jobs – is significantly bigger (~1450cm3, the same capacity as a medium sized car engine) and contains about one hundred and twenty billion neurons. This entry was posted in Beekeeping, Science on November 16, 2018 by David. The bees might recognise my face, but inside a beesuit? Perhaps not. However they would probably recognise my smell 🙂 Their sense of smell can also be trained. David you brighten up my Friday, no matter if it’s a technical update, practical technique, bit of DIY (BIY? ), or a left field musing. More power to your elbow and come to Gloucestershire when you have the chance. Long way to Newent, but it’s a lovely part of the world. I sometimes travel that far to speak … I’m in Cambridge sometime early next year and did the Welsh BKA Convention last year. Interesting I wondered where you dropped off too. RE your Brexit, I heard some politician suggested to his two gran aunts that they all go to the cinema last Tuesday night they both agreed, then he said they could go see either “The chainsaw massacre” or” I spit on your grave” after all they did have a democratic decision to go. It was fun for a while seeing you all try to sort it out but the ante has upped a bit since. Ask the people because the politicians haven’t a clue. Didn’t we get into this mess because we asked the people in the first place? Will you be speaking at a function/gathering in Cambridge or is it a private visit? Its not far from me so if you’re speaking in public I would like to come and listen. Cambridge BKA have a spring convention on the 23rd of March 2019. I’m pretty sure that registration is open now. PS … but a quick plug for my next speaking event which is at Fortingall and District beekeepers on Tuesday night (20th November), 7pm at Camserney village hall near Aberfeldy. Hello David, just thought I’d run this past you. Do you think that venom from apis melifera differs in potency from strain to strain?last night I went to remove for a retired beekeeper a colony that has taken up residence in an empty hive during the summer, brood box is not in very good state so was taping up all the holes and gaps and in hindsight it was warm here yesterday and bees had been flying (as they are now) so it was inevitable that that a guard was going to pop out and do its job which it did and stung me on the hand(no gloves on) no big deal have been stung many times before, I then decided we will leave well alone until the temperature drops for few days then try again.Anyway my hand is still swollen today which is unusual for me. It appeared to to be a different sting to the usual. Now I was told by the beekeeper that they were bit on the snasty side and when I saw them exit the hole in the hive big time they will take a bit of taming , but hey they’re bees doing what bees are meant to do and I will try and manage and preserve them as best I can. So anyway just to recap, do you think that there’s any relation between the potency of bee venom strain to strain and or aggressive behaviour? Sorry one question has now turned into two!!! I tend to see quite a few different strains of bees during the season. Some natives, many mongrels, some italians and some psychopaths … all can sting and if they get you in a delicate or sensitive location it hurts like hell. I suppose there’s a possibility any immunity you built up over the season has waned a bit by now. Given that the capacity of a car engine is the empty space in the middle of it, your reference to the exceptions in remarkably responsible jobs might be the exceptions proving a rule. Honey bees are not the only smart bees. Could they perform this as well? What is the brain size of a bumble bee? How about a bee circus at a fun park? Thanks Dieter … nice video. There’s also a great article and associated videos of bumble bees pulling a string to retrieve a reward. The same lab (Lars Chittka’s) have also shown that honey bees can count. My guess is they like Monet because of a shared interest in water-lilies. I’d have to go back and look in detail at the statistics again (but life’s too short!). I seem to remember that there was a very slight ‘preference’ for Monet, largely based on how convincing the statistics were. However, I can guarantee that this preference wasn’t because of a preference for water lilies … neither the training pairs of pictures used, nor the test pairs, included any of the pictures of water lilies from Giverny. Perhaps the preference is because they simply have an aversion to angular representations of people with two eyes on one side of their heads? !